Andalucia the ancient city of Cordoba. The historic Centre of Cordoba. This was built in early 1st century BC acrross the Guadalquivir river. Cordoba boasts some of Spain’s finest scenery. Flat fields covered in almonds and olive trees, rugged mountains covered in pine trees, ancient castles, major cities, small villages and medium sized towns. All of these a reminder of how this fascinating country has willingly adopted the history and cultures of its many invaders to grow into a unique member of the European family. 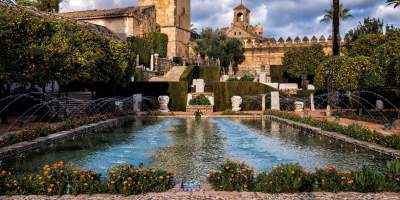 Nowhere in Spain will you feel the presence of this powerful Spanish culture than in the ancient city of Cordoba. The origins of Cordoba are lost in the mists of time. It´s position by the river and the fertile farming land of the Campiña made it a perfect place for the first prehistoric settlements. You can see the influences left on Cordoba by it´s various invaders. 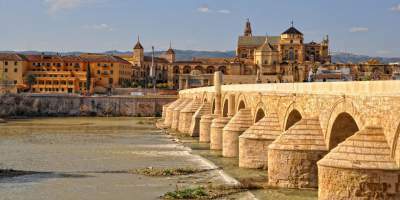 Cordoba was conquered by the Romans in the 2nd century AD and left a great number of monumental buildings. There is a beautiful, Roman bridge right in the historic Centre of Cordoba. This was built in early 1st century BC acrross the Guadalquivir river. Until Granada, this was home to the western world’s most important Muslim population. 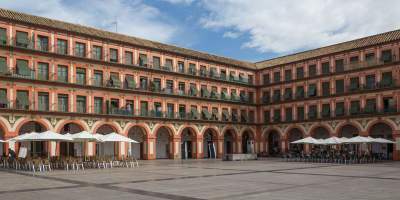 Some of the worlds first known universities and medical schools made this a desirable place to live under Moorish occupation patios. A huge mosque built here was later taken over by the Christians, who rather unusually allowed a large part of this rather beautiful building to merge into a cathedral which they built on the same site,giving Cordoba the gift of one of the most unusual and impressive buildings in the world, known as the Mezquita. Nearby another beautiful building the Alcazar, graces the town. Between these two outstanding buildings charming cobbled streets wind amongst whitewashed buildings, which are home to the famously beautiful Cordoba patios. More than that, however, is that Cordoba is also a world heritage site. It has such an impressive culrural and momumental patrimony,and a strategic position near the river Guadalquivir, that the legacy left by it´s many settlers meant Cordoba was always considered a Privileged place. The world heritiage site award aims to ptotect, identify and conserve cultural or natural heritage considered to be particularly valuable. 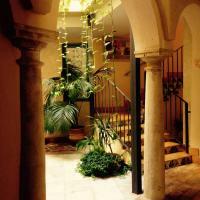 This charming hotel occupies a historic building in the centre of Cordoba. It offers attractive rooms with free Wi-Fi access. Vacation rental property for your holidays around Costa de la Luz Andalucia. Costa de la Luz Andalucia Rentals Lovely Luxury Villas, apartments, penthousenr beach various size bedrooms situated in different areas of Costa de la Luz Andalucia. Also Hotels with pool Costa de la Luz Andalucia. Properties Costa de la Luz Andalucia with privatepools, nr beach. Dramatic price reductions in euros. Some nearmountains, or urbanisation coastal properties Costa de la Luz Andalucia. Book direct Villarenters. Nr Town centre Costa de la Luz Andalucia. Property rentals in Costa de la Luz Andalucia ,holiday villas rental apartmentsprivate vacation homes in the resorts of Costa de la Luz Andalucia, Golf properties beach views Costa de la Luz Andalucia.apartment holidays with pool villarental vacations.Holiday situated detachedvilla Costa de la Luz Andalucia. House rent villarenters Costa de la Luz Andalucia, choiceprice luxury sea beautiful south facing, owners penthouse Costa de la Luz Andalucia. Village cottagesleeps Costa de la Luz Andalucia Rentals bedrooms vacations swimming pool mountains bedrooms.Costa de la Luz Andalucia. Bali Villas and More has searched the island and hand selected only the best villas. We have villas in all of Bali’s popular holiday locations, to suit every budget. We also offer an extensive portfolio of Bali luxury villas as well budget options. Bali romantic villas provides the complete package, delivering the perfect holiday for you. Rest assured that Bali Villas and More will find you the perfect villa, and your dream holiday will become a reality. See our range of cheap Bali villas that still deliver luxury. Bali Island ATV is the leading ATV Bali tour operator. Operational since 1996, is the number 1 provider of Bali quad biking tours. Offering 1 or 2 hour tours, you’ll get the experience the exhilaration of riding a high powered quad bike. Enjoy visit https://www.quadbikingbali.com/ we’re committed to making sure that you have the best possible experience. Our two hour tours included return transfers from your accommodation to our base here at Yeh Gangga Beach. We can’t wait to welcome you and share an adventure together. AMO offers a complete menu of high quality spa experiences..Massages, Facials, Hair & Make Up, Waxing, Scrubs and more. Manicure, pedicure, nail polishes and designs, beauty treatments so that you really stand out on at that big occasion. Indulge at Amo Spa Bali committed to helping you look your best whilst you’re on the island, we invite you to the best spa in Bali. Establishing itself as a premier venue for quality, the Amo menu was expanded incrementally over seasons to become the leading spa in Bali. Created and directed by ex-model/actress and fast paced New York entrepreneur Navia Nguyen whose concept, style and fashion experience are transposed into the Amo locations. AMO offers a complete menu of quality spa experiences. We invite you to relax at the best spa in bali The success of the Amo Lifestyle brand largely influenced by repeat satisfied customers and word of mouth is now expanding into new areas. As the leading spa salon Bali, we offer unbeatable hair spa and massages, indulge at the best spa in Bali. If you get only Private Transport during Hajj and Umrah. So there is a Labbaik Hajj Umrah who provides best and cheap Transport during Hajj and Umrah. To get information send a query or call right now. Look no further, MC Entertainment & Svc is the only stripping agency with actual entertainers & strippers. Presenting a full production male & female exotic revue show, featuring the best Atlanta strippers from the best strip clubs in Atlanta Georgia List of Atlanta Strip Clubs click here mcentertainment.org Atlanta's BEST; a high energy audience participation show that caters to both men & women. It is a great party idea for a special party fantasy, celebrate a birthday, a bachelor or a bachelorette party! Or Google fun things to do in Atlanta Georgia. Copenhagen Airport taxi https://www.knopkatransfer.com/city/copenhagen.html reservation online. Looking for Budget Hotels in London Get the best hotel deals in London. We guarantee the lowest prices. Hu’u Villas offer you the very best Bali villas Seminyak. Located in downtown Petitenget, stay in the heart of the action within easy walking to distance to an unbeatable range of high end restaurants, bars, shopping, nightlife and the beach. The top honeymoon villa bali offers a range of extras. Enjoy a complimentary cocktail and VIP treatment, including access to the VIP Boat shed booths at Sea Vu Play. A honeymoon at Hu’u Villas is packed full of loving care and attention to really make your trip extra special.